MBT shoes can change the way most of us use our muscles as well as reduce shock forces to the entire skeletal system. View and buy MBT shoes online. Arrange a fitting with our MBT experts. 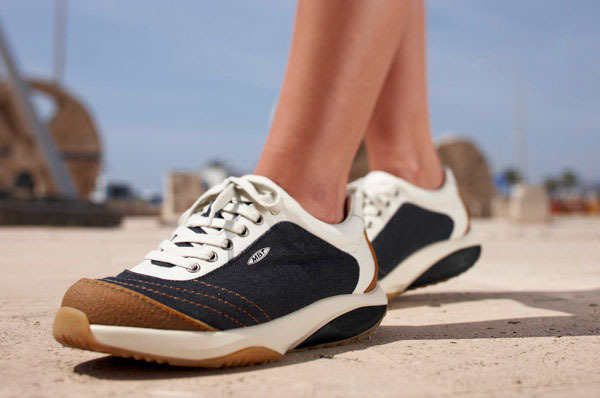 Masai Barefoot Technology makes all surfaces like walking in sand. Unlike most conventional training shoes that only support and cushion your feet, the unique lever spring action of MBT's challenge the core strengthening muscles to be more active. This creates good posture and increases shock absorption for all the joints. What is Masai Barefoot Technology? In essence MBT is a redesign of shoes to cause the user to have to balance while they walk. Like almost all Back in Action products the intention is to create a life style more compatible with the way our bodies evolved. MBT shoes create natural balanced walking posture and once acclimatised users report exceptional increases in vitality and well being. Most muscular and skeletal problems originate from poor posture and faulty gait patterns. Wearing MBT can help Muscle Toning, Core Stability, Weight Reduction and Improved Posture. Developed to cure back and joint problems, MBTs help to strengthen and tone the body, improve sports performance and help people lose inches. MBT changes a passive, straining gait into an active gait pattern that is gentler on the back and additionally stabilizes the pelvis and the spine. Due to MBT's unique curved layered sole (which is protected by design rights), it lengthens the body into a tall, upright posture and encourages use of neglected muscle groups. When walking or jogging users engage untrained muscles and burn more calories, helping people to tone and to lose weight efficiently. Even while standing the muscles continue working to maintain a centre of balance. With every step taken, MBT is therapeutic and simultaneously preventative. At Back in Action we like to see MBT's used as part of a comprehensive approach to body health. The Mobiliser can restore lost movement in spinal joints and MBT's can develop the core muscles to take full advantage of the new easy spinal movement. The Actulum chair creates balance and vitality while sitting, but most of our clients are still too inactive in their daily life. MBTs increase the energy used in walking and particularly develop the core muscles, thus restoring a more nomadic lifestyle without giving up the day job! A Back in Action mattress should allow greater rest and repair at night, but MBT shoes can then build on the better start to each day by using the deeper muscles and driving increased general fitness. Most of us are too rushed in life. We are often pressurized into a forward stance or worse our posture gets forgotten completely. Everything is 'on the go' in forwards motion, as illustrated in the pictures. As we walk about the hard surfaces we walk on are putting our body through extremes of unnatural pressure; overloading the joints from the ankles, knees, hips to lower back and upwards through the spine. We evolved walking on surfaces with "give". If you stop for a moment and think about your posture, check out your spine shape. What is your postural alignment like? Do you feel pressure through your body? Perhaps its time for a change. 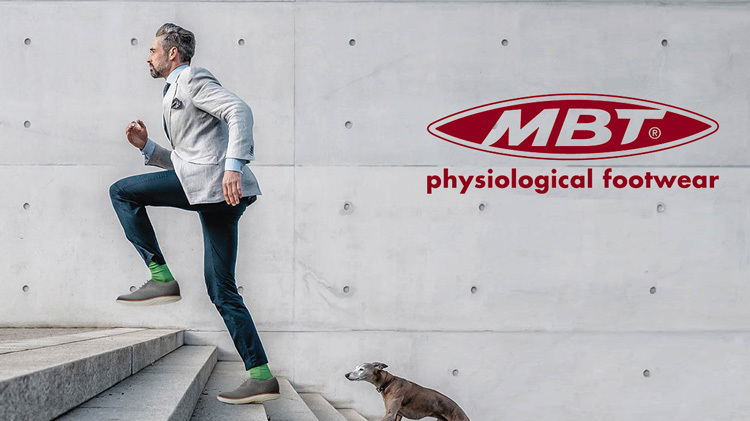 The MBT range of footwear is designed to allow you to walk on a soft, uneven surface in order to stimulate exceptional muscle use; so increasing tone, alignment throughout the body, benefiting circulation and giving you a feeling of overall good health and well being. Below we describe the benefits in more detail, related to the reasons you might use MBT. Top teams, world champions and olympic medallists use MBT for training and testify the positive impact on their training and performance. Training with MBT improves: Coordination, Core Stability, Power & Speed, Running Style, Endurance, Flexibility, Recovery and Injury Prevention. Performing on a high level needs to balance all of your abilities. MBT makes training more effective, challenging and gentle to your spine. For treatment, rehabilitation and prevention of: back, hip, leg and feet problems, joint, muscle, ligament and tendon injuries, therapy resistance. GPs, physiotherapists, osteopaths, chiropractors and Alexander technique teachers recommend the use of MBTs to successfully help prevent and treat injuries. Through the bio-mechanical function of MBT, the muscles, joints and spine begin to function in an anatomically correct manner. The postural muscles are toned up, joint wear is reduced, and pain is relieved.